Hondeklip Bay was formerly a favoured holiday destination for fishermen, divers and farmers. Nowadays, holiday makers from all over the country enjoy their holidays here. Hondeklip Bay lies about 104 km Southwest of Springbok and can be reached by different routes, the Messelpad, The Wildeperdehoekpas, through Soebatsfontein, or Kamieskroon, or from Garies. However, it usually takes about two hours to reach the town. Thomas Grace (a ship’s captain) came upon the town in 1846 and established a trading station. He named the town after a gneiss rock which vaguely resembles a dog. The first eleven tons of copper ore was shipped in 1852. Later Port Nolloth became the export harbor. The harbor in Hondeklipbaai now serves fishing and diamond boats. 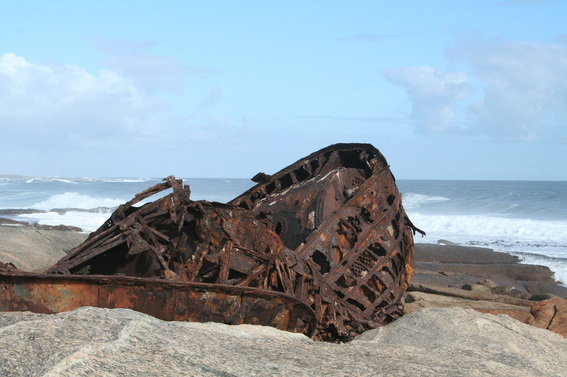 South of Hondeklip Bay lies what remains of the wreck of the Aristea, which was built in Scotland as a fishing vessel. In 1934, the Aristea served as a minesweeper during World War 2. Tragically, the Aristea ran aground on 4 July 1945 on its maiden voyage as trawler. Fortunately, there was only one loss of life. About 18 km SSE down the coast from Hondeklip Bay the mouth of the Spoeg River is located. Here you will find caves of archaeological interest. Please visit http://www.hondeklip.com for even more history on Hondeklipbaai/ Hondeklip Bay.